Address: Arsenalo g. 1, LT-01143, Vilnius. Tel. : (+3708 ~ 5) 262 77 74, (+370 ~ 5) 262 94 26. Fax (+370 ~ 5) 261 10 23. 1 October – 30 April: Wednesday – Sunday 10–17. October 1 – March 31: daily 10–17. 1 October – 30 April: Tuesday – Saturday 10–17 val. 1 September – 31 May: Tuesday – Saturday 10–17; Sunday 10–15. May – September: Monday – Friday 9–18, Saturday 10–18, Sunday 10–15. October – April: Tuesday – Saturday 10–17. pupils, students and OAP – 1 €. child under 7, disabled – free. Up or down 1 €. admission charge – 1, €. admission charge – 0,60 €. Department for Displays Registration and Preservation. Tel. (+370 ~ 5) 212 66 87. Department of Publishing. Tel. (+370 ~ 5) 212 02 65. Photo-studio. Tel. (+370 ~ 5) 261 81 44. Address: Arsenalo g. 3, LT-01143 Vilnius. Tel. (+370 ~ 5) 212 24 52. Tel. (+370 ~ 5) 262 94 26. Address: Arsenalo g. 5, LT-01143 Vilnius. Tel. (+370 ~ 5) 261 74 53. Opening hours: April 1 – September 30: daily 10–19; October 1 – March 31: daily 10–17. In the exposition there are on display the reconstruction models of Vilnius castles of the 14th-17th centuries, arms, iconography material. The tower has a sightseeing platform: from there visitors are welcome to enjoy the panorama of the city. Address: Pilies g. 26, LT-01123, Vilnius. Tel. (+370 ~ 5) 231 44 37. Address: Didžioji g. 26, LT-01128 Vilnius. Tel. (+370 ~ 5) 279 16 44. Address: Bokšto g. 20/18, LT-01126 Vilnius. Address: Vytauto g. 23 a., LT-00135 Palanga. Tel. (+370 ~ 460) 54 559. Address: V. Kudirkos g. 29, Kudirkos Naumiestis, LT-4482 Šakių rajonas. Tel. (+370 ~ 345) 57 451. Address: Ožkabalių II kaimas, Bartninkų seniūnija, Vilkaviškio rajonas. Tel./fax (+370 ~ 342) 69 365. The history of the National Museum of Lithuania begins from the year 1855 – in that year the Vilnius Museum of Antiquities was founded by Eustachijus Tiškevičius, the eminent collector and researcher of Lithuanian culture history. From the first day of its foundation the Museum was representing culture and history of The Lithuanian Grand Duchy. It was very popular and enjoyed abundance of the visitors. The defeat national liberation insurrection in the year 1863 brought a painful impact on Lithuanian culture. The administrative reparations also did not pass by the Museum of Antiquities. The exhibits, directly related to Lithuanian history, were taken away to Moscow in 1868. The remaining collections of the Museum of Antiquities were reorganised and passed to the possession of newly founded Vilnius Public Library. It was founded on the basis of former library of the Museum. During the years 1866 -1914, the Museum itself worked as a part of this library. In 1915, when the front of World War I approached, part of the exhibits was taken far away to Russia. 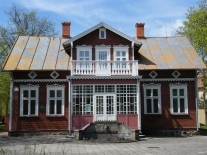 In 1919, based on the collections of the Museum of Antiquities and the Lithuanian Scientific Society, the Museum of History and Ethnography was founded. One of Lithuanian national liberation leaders, Dr. Jonas Basanavičius, was appointed there as the Director. In 1919, the Museum's creation work was interrupted by Polish occupation of Vilnius. On the basis of remaining collections, the museums of Archaeology, Ethnography and Nature were working in the University. In 1941, the Academy of Sciences took over all collections from all the museums in Vilnius. The eminent museum worker, culture historian Vincas Žilėnas successfully restored the structure of the Museum of Antiquities in 1952. The work, started in 1919 by Dr. Jonas Basanavičius, was completed - the Lithuanian Museum of History and Ethnography was created. In 1967, the Museum established itself on the territory of Vilnius castles in the building of the former New Arsenal.